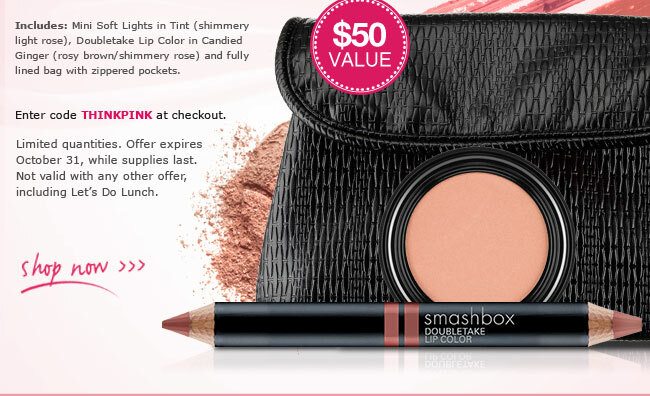 Free Think Pink Kit with the purchase of $75 or more at Smashbox until October 31st! Smashbox is doing their part in helping out with Breast Cancer Awareness Month. Super cute back, pencil and lip color- just use THINKPINK at checkout. Limitless Long Wear Smashbox Lip Gloss ($21) is a pretty pink new gloss new on the Smashbox shelf. All proceeds will go to the Breast Cancer Research Foundation, which is a great idea, since this month is Breast Cancer Awareness Month. The silky-smooth lip color stays put for up to 6 hours and protects your pout with SPF 15. The GlamBox ($68) is a $190 Value, and I think this is a fabulous kit. Get the rock-star treatment for eyes, cheeks, lips and complexion! Find everything you’ll need to create both classic glam and rock ‘n roll fab looks in this all-in-one kit, including nearly a dozen exclusive, limited-edition hues worthy of any A-lister.